While you soak in a luxurious bath with 100% Pure Bath Salts or vapors, don’t forget to light a candle to help set the mood. 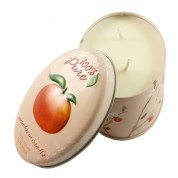 And what better way to do it than with one of the 100% Pure Candles? Is there anything that 100% Pure doesn’t do? They make amazing makeup, incredible skin care products, high-quality hair care products, delectable edibles, and now, candles too! These aromatic candles burn long and bright, emitting a delicious aroma that will awaken the senses while relaxing your body, mind, and soul. Light a match, ignite the wick, and watch the flame dance on the end of the string while shadows dance on the walls and ceiling around you. There’s no better way to relax and set the mood than with a candle. 100% Pure makes their candles with this in mind, creating the perfect complement to their skin care, hair care, and makeup lines. Currently available in three delicious aromas, the 100% Pure Candles feature a soy wax blend that burns clean and bright form the first time you light it up until the last time you burn it out. 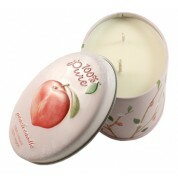 With a citrusy mandarin orange flavor, a sweet peach option, and a sour apple aroma available, you’ll have no trouble finding the perfect candle for your unique preferences. 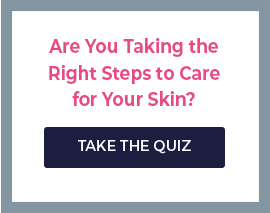 We’re guessing you’ll want all three! The decorative tin is perfect for keeping on display, enhancing the appearance of your living room or your bathroom. Each 100% Pure Candle will burn for 20 hours, emitting essential oils along with aroma to uplift your mood and intoxicate your senses. They’re perfect for setting the mood on a romantic evening, creating ambience during your bath, or adding to a relaxing environment on a cool, rainy winter day. 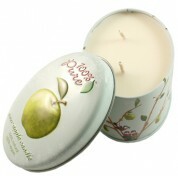 All 100% Pure Candles are free of synthetic dyes, fake fragrances, petro-chemicals, and other toxins.